Any house clearance company can apply to become a member of the UK House Clearance Association if they agree to follow our code of practice and abide by our membership rules below. Do you want to build your business in a professional and positive way? Are you looking for an association that represents the interests of its members, their customers, and the house clearance industry itself? Has your company been trading for at least one year? Your company must have a website. Your business must hold full, current, public liability insurance. 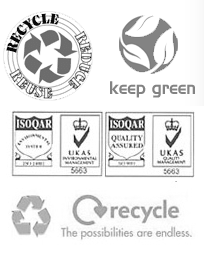 Your business must hold a current waste carriers license issued by the Environment Agency. Your business must be registered with the UK Tax Office and must have been trading for at least one year. A member may not use a name and/or trading style that could cause confusion with any other fellow member company. Must be willing to solve any customer issues amicably via ourselves, or directly with the customer. 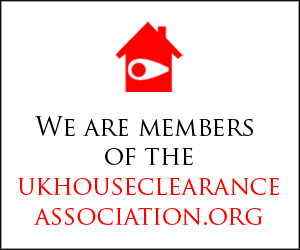 Failure to do so will result in your business being removed from the UK House Clearance Association list of reputable companies. If you feel your business is ready to move up to the next level, and you agree to abide to all of the above conditions then please contact us for further details. 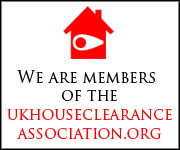 Once you have been accepted as a member, you are required to display our logo (see below) on your website complete with a link back to the UK House Clearance Association web site.